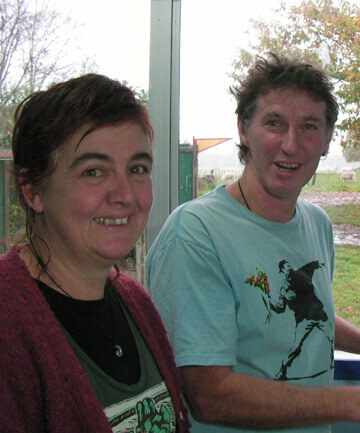 We (Jan and Geoff Speeden) have been here at Millstream for over 30 years, and have nearly 4 acres of land. We had our house moved here, and originally we lived in the middle of a paddock. Now our gardens are maturing, it’s hard to imagine the place without trees everywhere. We have a commitment to organic gardening techniques wherever possible. The land includes a wonderful wild creek (with tame eels we can feed by hand), and some steep banks where a whole variety of trees grow. If you go to our blog you can access info on our herbs and vege gardens, as well as a variety of recipes and articles about herbs (not to mention lots of photos). We have been making and selling our herbal ointments for over 30 years now. Our first ointments were made from wild herbs in Soya Bean Oil and Beeswax, and were sold in recycled jars at local markets. We then started supplying two of the health shops in Hawkes Bay (who we still supply). Over the years we have extended our range from a basic 6 and now have over 50 different ointments and creams, which we wholesale to about 40 shops around New Zealand. For many years we manufactured our ointments in a small caravan converted into a kitchen. When we outgrew this we moved an old school classroom onto the land. This is now the hub of the business and has a kitchen, plenty of storage space, a retail shop, and room for all the other activities a small cottage industry requires. This is a great work space for us and we only have to walk across the garden to get there. You are most welcome to call in and visit, but give us a ring first (06-878-1511) to check that we're home.